Convoy’s new form, which transforms into a GT-R sports car, is a very unusual transformation in which he uses the super-material frame built into his body to link with the hyper-being from the future, “Alternity.” This body, which is known as the “Auto-Avatar,” is in a way an avatar of Convoy that has evolved into a higher form. Alternity includes a collective of many Convoys from different dimensions, and each of them can have its own avatar. 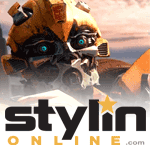 So far, the two Auto-Avatars that are known to exist are the silver one known as “Vector 01” that was created in the “BT World” from which Alternity originates, and the red traditionally-colored “Vector 109.” Each has ranged space-time weapons on both arms called “tachyon blasters,” and in car mode, they can activate the Timaeus Drive that opens the super-dimensional portal. With these new abilities, Convoy will continue his mission to protect peace on Earth and defend freedom, and will thus challenge Megatron’s ambitions. * Ten-Dimensional Processor Block [head]: The brain-part that controls multi-dimensional thinking and consciousness. * Timaeus Powertrack Generator [chest]: Generates the racetrack for the super-dimensional-locomotion Timaeus Drive. * Universal Emulation Engine [waist]: Universal mechanism that replicates all mechanical devices. * Phasic Isolation Shield Emitter [knee]: Shield emitter that erases one’s presence and offers total protection. * Timestorm Detector Array [door-wing]: Able to remotely detect the generation of changes in time-space and immediately calculate their coordinates. * Alternium Hyper-Frame [clavicle]: Higher-dimensional-material receiver that physically links the Auto-Avatar and the true Alternity. * Anti-Hytherion Spacetime-Piercing Tachyon Blasters [forearm]: Super-long-range armaments that can strike targets existing in the past, the future or in other dimensions. * Planet Force Storage Reactors [lower leg]: Where the vibrational energy of the planets is gathered as backup energy storage. 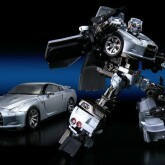 Convoy – Nissan GTR (Ultimate Metal Silver) toy information. 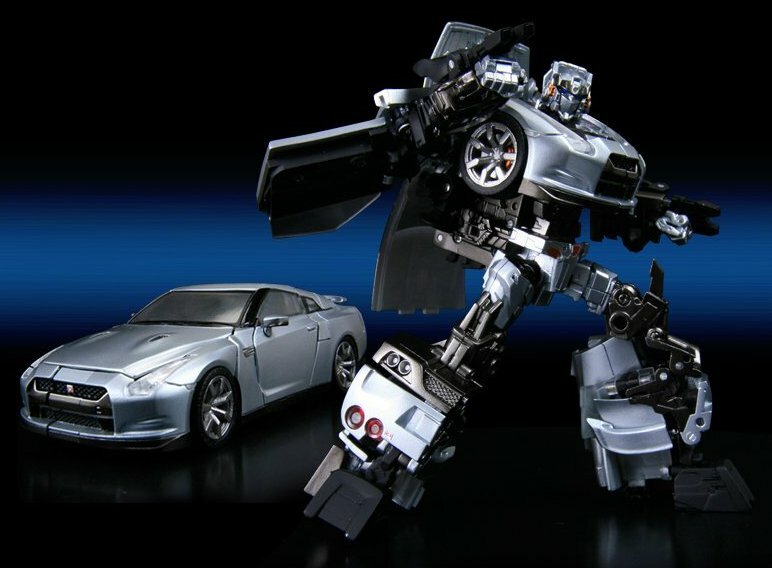 Convoy – Nissan GTR (Ultimate Metal Silver) parts information. The time is 2009. The place is another Earth. There, the robot life forms called Cybertrons and humanity live peacefully together. However, a quarter century after they first met, an unknown threat endangers the world. On the four outer planets of the solar system, large marks resembling the claws of a beast have simultaneously appeared. Two years before, he had met a messenger from another world and made a secret promise. In the year 2009, the evil Megatron would bring the terrifying Beast of Time and come to destroy the Earth. The beast “Hytherion” was a super-dimensional life form and a powerful enemy that those on Earth could not even touch. The only thing that could act against this threat was the power of the multi-dimensional space protectors called “Alternity.” Convoy agreed that when the danger appeared, he would become a member of Alternity and fight alongside them. In the center of the ring, a spacetime window opened and a shining metallic frame appeared from within. 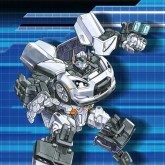 Convoy fused with the frame, and before the Cybertrons’ eyes, he was reshaped and transformed into a form matching that of the silver visitor. In that instant, he was reborn as a manifestation of the Alternity super-beings. As Convoy raised his hand into the skies and cast aside the veil of the dimensions, the row of Hytherion’s giant fangs became visible covering the heavens. And so, with modern Earth as its stage, an unimaginable battle began. Biology: Alternity is a future form of the Transformers which, after 900,000 years, have evolved into a celestial being. Their bodies are made of a higher-dimensional material called Alternium, and they have huge forms that straddle multiple parallel worlds. As a result, it is impossible for terrestrial beings to comprehend the entirety of their appearance. Each individual fuses with their selves of countless parallel worlds to make up a giant manifold being. The word Alternity, referring to their multi-dimensional nature, has become the name for the entire species. Abilities: They are able to “reach out their hand” to various time periods and dimensional worlds, and they can use their powers to manipulate reality and duplicate timelines. Furthermore, when taking individual action on the mortal plane, they use Transformer bodies called “Auto-Avatars.” Each avatar’s mechanical function is about the same as that of a modern Transformer, but various high functions have been added through the technology of the Alternity. 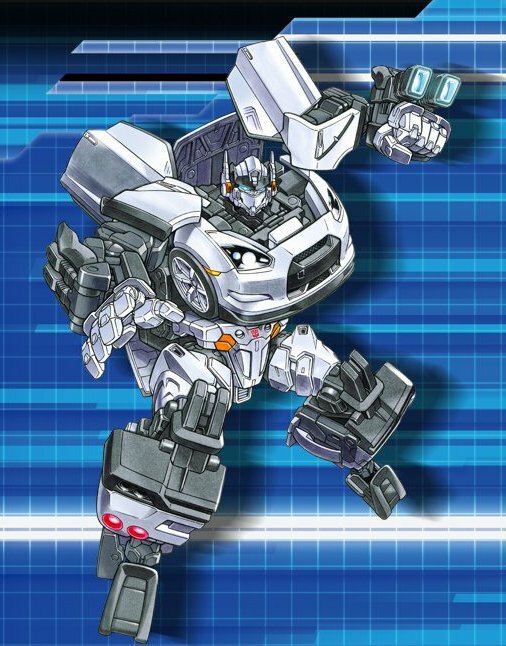 The Auto-Avatars normally transform into the form of a sports car, which is the most efficient method of transportation for using the super-dimensional locomotion of the Timaeus Drive.